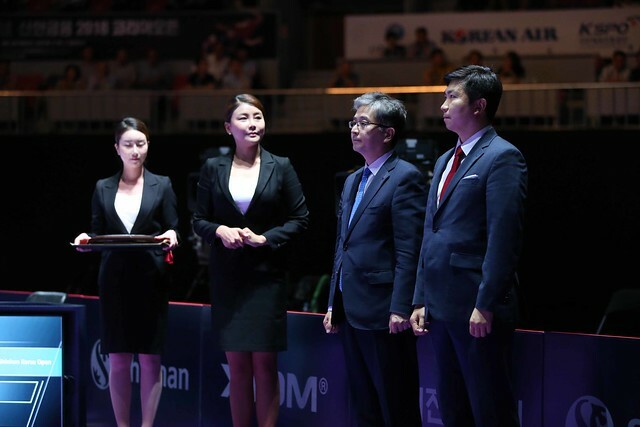 The group phase of the Women’s Singles qualification tournament in the latter stages, it was mixed fortunes for the host nation on Wednesday 18th July at the Seamaster 2018 ITTF World Tour Platinum Shinhan Korea Open. Commencing matters the highest rated players in their respective groups, there were defeats for Yang Haeun and Yoo Eunchong; conversely there was unexpected success for Lee Zion and Lee Eunhye. They remained unbeaten, recording wins against adversaries tipped for first place. Lee Zion beat Japan’s Satusuki Odo (11-8, 10-12, 11-5, 8-11, 11-9, 11-9), Lee Eunhye accounted for Spain’s Galia Dvorak (11-7, 7-11, 11-1, 11-8, 11-6). Alas for Yang Haeun, it was defeat at the hands of China’s Li Jiayi (6-11, 7-11, 13-11, 9-11, 11-8, 11-7, 11-6), for Yoo Eunchong, Portugal’s Shao Jieni proved her nemesis (7-11, 4-11, 11-2, 12-10, 11-7, 11-6). Success in their concluding matches against the highest rated in their respective groups; it was the same for China’s Feng Yalan and DPR Korea’s Cha Hyo Sim. However, the performance to catch the eye was that of India’s Madhurika Patkar. Feng Yalan beat Japan’s Yui Hamamoto (12-14, 11-7, 11-6, 11-6, 11-5), Cha Hyo Sim defeated Chinese Taipei’s Cheng Hsien-Tzu (13-11, 11-6, 8-11, 11-9, 9-11, 11-7). Meanwhile Madhurika Patkar overcame Maki Shiomi, like Yui Hamamoto from Japan, in a tension packed seven games duel decided by the minimal margin (11-5, 5-11, 5-11, 11-9, 11-9, 6-11, 12-10). Presently on the Women’s World Rankings, Madhurika Patkar is listed at no.153, Maki Shiomi is a 110 players higher at no.43. Notable performances and amongst the leading names on Women’s Singles qualification stage duty, there also were worthy efforts to conclude matters and secure first places. China’s Gu Yuting beat Korea Republic’s Park Joohyun (11-7, 11-8, 11-7, 11-4); likewise there was success for the Japanese trio of Miyu Kato, Saki Shibata and Honoka Hashimoto. Miyu Kato accounted for Chinese Taipei’s Su Pei-Ling (11-8, 11-4, 11-9, 13-11), Saki Shibata beat Uzbekistan’s Regina Kim (9-11, 11-4, 11-1, 11-7, 11-3); Honoko Harimoto ended the hopes of DPR Korea’s Ri Hyon Sim (14-12, 11-3, 11-3, 10-12, 11-6).